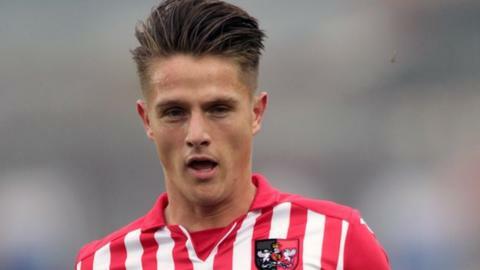 Exeter City thumped early League Two leaders' Leyton Orient to end their winning start to the season. Tom Nichols put Exeter ahead from the spot after he was fouled by Charlie Grainger, before Alex Nicholls fired in from long range to double their lead. Orient almost found their way back into the game but Matt Oakley cleared Jay Simpson's header off the line. Nichols scored his second penalty when David Wheeler was brought down by Alan Dunne, before Wheeler sealed the win. "The penalty early on unsettled us but the defeat was fair and square. "They took their chances and we didn't. We had a lot of possession of the ball and didn't work their keeper nearly enough. "Charlie [Grainger] was maybe a bit hyped up, came out early on and made a bad decision. But in the second half he made a few good saves. "We lost 4-0 but in my opinion I don't think that is a fair reflection of what went on. The 'manager of the month curse' struck big-time today." Match ends, Exeter City 4, Leyton Orient 0. Second Half ends, Exeter City 4, Leyton Orient 0. Attempt saved. Blair Turgott (Leyton Orient) right footed shot from outside the box is saved in the bottom right corner. Substitution, Exeter City. Manny Oyeleke replaces David Noble. Bradley Pritchard (Leyton Orient) is shown the yellow card for a bad foul. Tom McCready (Exeter City) wins a free kick in the defensive half. Attempt blocked. Scott Kashket (Leyton Orient) left footed shot from outside the box is blocked. Substitution, Exeter City. Tom McCready replaces David Wheeler. Lloyd James (Leyton Orient) wins a free kick in the attacking half. Substitution, Exeter City. Craig Woodman replaces Jamie McAllister. Corner, Leyton Orient. Conceded by Troy Brown. Goal! Exeter City 4, Leyton Orient 0. David Wheeler (Exeter City) right footed shot from the centre of the box to the bottom left corner. Attempt saved. Ryan Harley (Exeter City) left footed shot from the centre of the box is saved in the centre of the goal. Attempt missed. Scott Kashket (Leyton Orient) left footed shot from outside the box is too high. Attempt missed. Sean Clohessy (Leyton Orient) right footed shot from the right side of the six yard box is just a bit too high. Attempt blocked. Blair Turgott (Leyton Orient) right footed shot from the centre of the box is blocked. Substitution, Leyton Orient. Scott Kashket replaces Alan Dunne. Mathieu Baudry (Leyton Orient) wins a free kick in the defensive half. Attempt blocked. Tom Nichols (Exeter City) right footed shot from very close range is blocked. Ryan Harley (Exeter City) hits the bar with a left footed shot from outside the box. Attempt missed. Dean Cox (Leyton Orient) right footed shot from outside the box is close, but misses to the left. Attempt saved. Connor Essam (Leyton Orient) header from the centre of the box is saved in the centre of the goal. Substitution, Leyton Orient. Blair Turgott replaces Sammy Moore. Goal! Exeter City 3, Leyton Orient 0. Tom Nichols (Exeter City) converts the penalty with a right footed shot to the centre of the goal. Penalty conceded by Alan Dunne (Leyton Orient) after a foul in the penalty area.